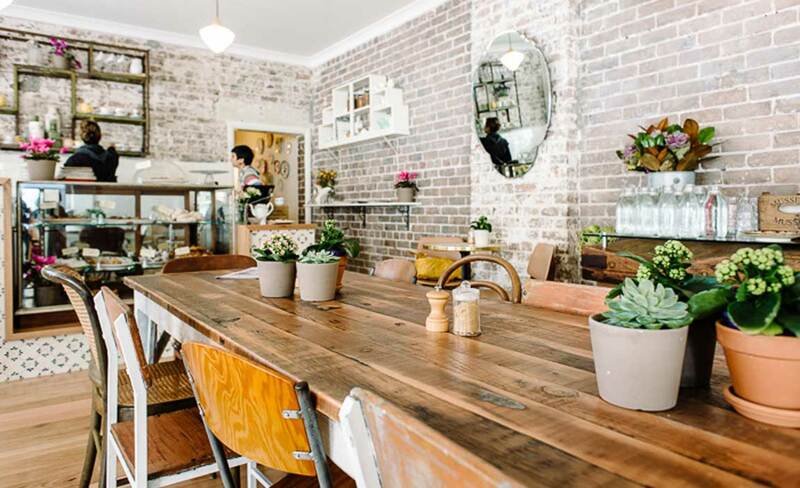 This expert husband and wife team are serving up a warm breakfast, a tasty lunch, house-made pastries and craft beer in this sunny pocket of Petersham. If only we could marry cafes. If we could, there'd be quite a few people down on one knee proposing to the Pig & Pastry. This charmer of a cafe is pulling all the right strings and you'll be hard pressed not to consider a lifelong commitment to them. Let us detail our incentives for such love-struck madness. Come here on any day — rain, hail or shine — and the cafe will be on maximum dazzle. Big windows flood the room with light, making it open yet still cosy. There is a communal table with mismatched chairs, or benches along the window with cushions make for more intimate sittings. Exposed brick walls are dotted with shelves for crockery and the rustic, wooden decor further evokes this countryside feel. P&P even overlooks a paddock — well, almost. Petersham park is just across the way and the perfect spot to take your Little Marionette coffee ($3.50) and sandwich ($8.50) to sit in the sunshine. The team behind this sunny pocket of Petersham are husband and wife Iain and Katherine Smart. Neither are strangers to the hospitality field: Iain is a trained baker and Katherine previously at Kitchen By Mike. So it's fair to say, the menu is pretty spesh. They source all their ingredients locally to complement their own house-made products; including bread, brioche, cakes and ice cream. Breakfast is served until midday, with the usual staples dazzled up to be tastier creations than usual. Fruit and nut toast ($9) is drizzled with honey and a generous dollop of ricotta and banana; and a warming porridge is topped with winter fruits and a toasted seed mix to add some crunch ($11). House-made braised beans ($14) come with a poached egg and if you want some extra pizzazz, add chorizo for an extra $2. Where this cutie really hits its pace though is with its license to serve you a refreshing ale along with your schnitzel come lunchtime. That's right, the list of available booze isn't lengthy, but substantial enough to satisfy the craving should you feel like a refreshing Vale Ale lager ($7.50) to accompany the crumbed chicken schnitzel ($16) or crisp confit duck leg ($21). Or perhaps a Baby Doll sav blanc ($7.50a glass/$36 a bottle) is more your poison — pair this with the pumpkin risotto ($16) or a tuna nicoise salad ($17) and like we said — that marriage proposal isn't as mad as it seems. For something lighter, soup of the day is $10 or portions of salad go for $6 a pop. Pastries are a key feature of their name, thus it's only fitting that a pumpkin, fennel & goats cheese quiche ($8) is divine, so too is a spiced lamb sausage roll ($6). The dessert pastries are just as decadent — it's hard to refuse these glorious morsels of sweetness. And the name? Attributed to Iain's sister and brother-in-law who have a Pig & Pastry café in York, England, it's becoming somewhat of a global brand. So go on, get down on one knee and consider some sort of marital agreement. It'll certainly be a nourishing, happy relationship.